"I wanted to go to Nowhere, wherever it didn't exist. I wanted to cease to have to exist and let the rest of the world deal with what I'd unleashed upon it." It was simply meant to be a joke. Tom only wanted the world to believe that vampires were real for a day or two, and then come clean. But when real vampires surface and begin to annihilate the human race, Tom can never reveal the truth. Thrust into a new world where danger is under every rock and death looks unbelievably human, Tom, armed with only his father and the smallest group of distant friends, must learn the tools of survival - whether it's fight or flight - and come to terms with the realization that, sometimes, it's all your fault. I really wanted to end up liking this novel. It was kind of a roller coaster ride. In the beginning I wasn't really feeling it until the video goes on the air, thats when things picked it a lot for me. But then once the attacks start happening it turned downhill again. In the beginning the characters were all pretty well done. They each had their own personalities and could easily be identified with or easy to put a face to them for someone you knew in real life. By the end of the book they all just went flat. 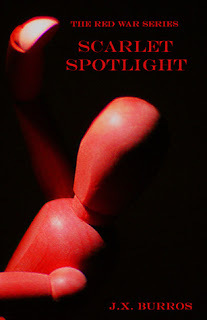 Scarlet Spotlight ended up being a lot of telling and not enough showing. Tom narrated it the entire time, and there was never a break where the author could just describe what was going on. A lot of the time I felt like I couldn't accurately picture in my head what was going. Like when Tom describes a house that has been destroyed, I couldn't really picture what it looked like. Did it look like a tornado went through it? Did it look like it just collapsed? Was some of it still standing and just looked like ancient ruins? I don't know, because I felt like I wasn't properly explained. I feel like what started as a possible great story just turned flat by the end and wasn't at all what I expected from the beginning. The characters went from greatly created people to people I either didn't recognize anymore in the blink of an eye or people I didn't even want to hear about anymore. There was some parts that had me hooked so I did like some parts, but by the end my like of the novel was gone. One thing that really kept me reading was Alicia's character. I knew something was up with her and I could feel like she was going to end up being a vampire, but I thought maybe she would turn into one who ended up loving Tom or just at least helped him get out of this crazy situation. When nothing ever really came about her I was really disappointed, because I thought her house would be the first place he went after he left home since she didn't have any windows. When she turned out to be the "bad guy" I did expect it by then because it was a little obvious to me when she called Tom about being stuck in the high school. Hannah's character was overall the best one of the sub-characters. She pretty much stayed true to herself throughout the entire novel except when she professed her love for Tom. The entire time she has been hooked up on Jack and then when he finally leaves town to get away from the danger without even telling her he is leaving when he is supposed to be in love with her she is suddenly always loved Tom? I get maybe she was hoping for Jack to change, but it was a little farfetched. A character I couldn't stand anymore while reading was Tom's dad. He has always been described as this amazing dad and then when danger strikes and it is time to get your kid out of danger you tell him he needs to stay and help save the people of their town and that if he wants to leave he can leave you there all because of an old high school friend? I get that his dad wants to stay at the house in case his friend comes back so that he can tell him he is sorry and that he never judged him, or whatever, but do you really think that after all these years when the friend has yet to come back that he is going to come back to town now that vampires are there killing people? I don't think so. His dad needs to get a facebook to find his friend and then get his son out of there. I was so mad at his dad for not being a parent. Lastly the ending really bothered me. Tom and Hannah are trapped in this high school with a crazed vampire and then when they set the school on fire everything in the world is pretty much ok? All of a sudden there are all these law enforcement and fire fighters there to help and no sign of any other vampires? It just made no sense that here Tom has been all alone and then when he kills one vampire everything in the world is right again. Yea I know he ends up helping the military to destroy the rest of the vampires, but still it was just too convenient for my liking. *sigh* that felt good to get off my chest. I am sorry J.X. Burro's if you are reading this rant, but I had to get off my chest what I didn't like about this book. I am no way trying to be mean so please, please don't take it that way. If anything I hope it helps you with the rest of the series to know where things can be improved. I did want to like this novel, but by the end it turned flat. What began as amazingly well created characters turned into characters I no longer recognized in the blink of an eye. People Tom were supposed to trust turned into people he had to question and stay away from in the blink of an eye as well. There were some parts that I did like and kept me reading to hopefully reach an ending I ended up liking, but in the end the series turned out to be one that I would not care to continue with.